We are delighted to have successfully completed our largest contract to date with a large multinational company. We provided our complex electronic and mechanical assembly services to a Fortune 500 company which operates across 140 countries. As part of the contract we manufactured complex analysis equipment which will be utilised for nationally important infrastructure. The equipment was checked by our staff who are independently assessed in accordance with IPC-A-610 standard. We are thrilled to have delivered a contract with such a high-profile company and firmly believe this win is true testament to our ongoing commitment to provide the highest quality PCB services in the industry. Our facilities enable us to work very closely with all our clients across the country making sure we consistently tailor our approach to fit their individual needs and that we do this right across the product life cycle. 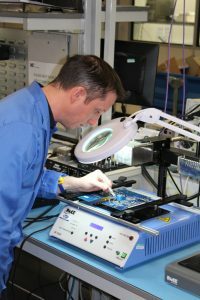 Having these incredibly responsive, flexible capabilities and in-house facilities is something we very much pride ourselves on and, as the business continues to grow, is the element that we firmly believe will make us the market leader in electronic assembly manufacturing. If you would like more information on our PCB assembly services, please contact info@hindleycircuits.co.uk or call us on 01670 590646.